Fig. 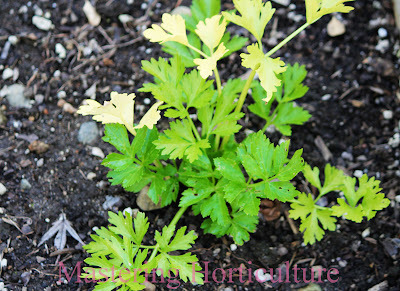 1 Older leaves on celery turning yellow while the growing points in the center remain green. The last time I looked there were seventeen known essential elements for plants. Each element performs a specific function. When conditions are at optimum levels we see a healthy plant, but when one or more element is deficient we see a "needy" plant. To determine which of these various elements is lacking, one has to begin by understanding where the plant stores all its limited reserves. Some elements are like cash - they can be used anywhere, while some are like gift cards - which can only be spent in specific stores. Plant nutrients are either plant-mobile or plant-immobile. Understanding these two characteristics is important because it helps gardeners interpret deficiency symptoms more accurately. Plant-mobile nutrients are those that are capable of being translocated within the plant. When a plant is deficient of these elements, the nutrient that is already within the plant will be transported to where it is needed most - the young tissues. Deficiency symptoms of plant-mobile elements are observed on the older leaves first. One example of a plant-mobile nutrient is nitrogen. If nitrogen is deficient in a plant, older leaves would turn yellowish first while the newer leaves remain relatively green (Fig. 1). The plant directs the nutrient where it is most needed to prolong the life of the stressed plant. By now, the answer to this question is obvious. Plant-immobile nutrients cannot be translocated from older tissue to a new one due to the nature of the elements and sometimes other conditions. In other words they are stuck where ever they landed the first time. They have reached their destination. Deficiency symptoms for these elements are observed in the young plant parts. Calcium is an example of plant-immobile elements. It plays an important role in cell expansion. When calcium is deficient, the young shoots and flower buds exhibit the devastating effects. If the condition is not corrected the shoots and bud get aborted eventually. Examples of plant-immobile nutrients are: Iron (Fe), Calcium (Ca), Manganese (Mn), Zinc (Zn), Copper (Cu), and Boron (B). Plant nutrients are like humans. Some are always moving to where the activity is going on while others just settle where they landed the first time until they go back to the ground. Very informative post. I wish I knew more about the science of gardening. I always learn new and interesting facts when I read your posts! GirlSprout -- Thank you! I've spent many years studying (undergraduate and graduate) plant science. Whenever I have the time to write, I share what I know so that others may also learn from it. It's very clear and easy to read. I have studied this topic and it's quite unclear how these elements work. thank you so much to let me understand it clearly. ps. Sorry if my english skill is horrible. But I appreciate your post so much. So I would let you know. Thank you for the feedback! I'm glad that I could be of help to you. thanks for the valuable information.you explained it in a very simple way.it'll be helpful to my students.from now i'll be a regular viewer of ur posts. Born and raised in the Philippines. Attended the University of Reading, England (PhD in Agriculture), University of the Philippines (MS in Horticulture) and Cagayan State University, Philippines (BS in Agriculture). Now residing in California with husband and three children - enjoying a God-dependent life.